From 8 basic shapes-circle, A-line, stretch pencil, wrap, bubble, tailored pencil, front-opening, and culottes-you will learn the skills to make skirts that have pockets, color blocking, gathers, ruching, darts and more. All the basic techniques are explained, so you'll feel confident with essentials like inserting zippers, attaching waistbands, gathering, pleats, making buttonholes and adding linings. There are also handy tips on how to take measurements and on choosing the right fabric. Skirts are the perfect first garment for beginner dressmakers, and there are some really simple designs here. 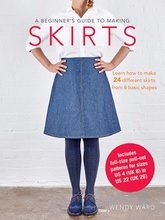 So arm yourself with this book and some fabric and you'll be on your way to updating your wardrobe with unique skirts that are a perfect fit! Wendy Ward is a regular contributor to Sewing World Magazine and her first book My Fashion Label about fashion design for kids was published in 2014. She lives in Brighton, UK.